Like a number of other photographers I was in Paris on November 13th 2015. The terrorist attacks that killed 130 and maimed many others took place that evening during the annual Paris Photo event at the Grand Palais, in the centre of the city. I was having dinner with friends when news started to filter through of two rogue cars carrying gunmen who were attacking, at random, a number of restaurants and bars. 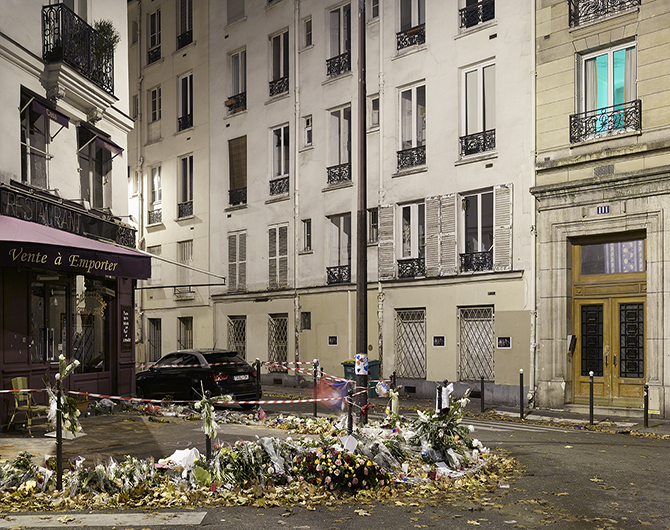 Only later did the terror of the Bataclan theatre, where 88 fans of ‘Eagles of Death Metal’ lost their lives, become public. I’ve never considered myself a conflict photographer and the fact that I was only carrying an iphone served as an excuse to retreat with haste back to my hotel and watch events unfold on television. The following day I walked through streets that were eerily silent, stopping off at the Place de la Republique en route to Gard de Nord, before heading home. For the next few days I sat in my Brighton studio listening to details of those terrible events unfold, trying in vain to supress the guilt for retreating as I had. As time passed I felt an increasing urge to return, until, on the fourth day, I did. Arriving at Gard du Nord at 8pm I met a car and guide and spent the night driving around every site, often returning several times in the hope of finding each one empty. This proved possible everywhere except outside the Bataclan, where traumatised survivors still gathered for mutual support. There I listened to first-hand accounts of horrors witnessed, as well as uplifting tales of courage and community support. As dawn broke I was back on the Eurostar travelling home once again. These are the pictures I made during that evening.